In November the French hospital group Ramsay Generale de Sante, majority owned by Australian Ramsay, has announced the successful acquisition of 98.5% of Capio’s shares following a public takeover offer. Prior to this, the Capio board accepted a revised offer of SEK 58.00 per share (+39% premium and valuing Capio EUR 1.6bn) after rejecting the initial offer of SEK 48.50 per share earlier this year in June. After this transaction the joint group represents a global leading hospital operator with presence in Australia, France, Indonesia, the UK, Sweden, Norway, Denmark and Germany with more than EUR 3.8bn in sales. As part of its selective expansion strategy, ORPEA acquired in November the seven facilities of the German group Axion group with 985 beds including two high-end nursing homes (275 beds) in Hamburg (Elbschloss Residenz and Elbschloss Residenz Klein Flottbek). At the same time, ORPEA and Mr. Tavridis are setting up a joint venture 75%-owned by ORPEA to develop premium facilities in Germany. The aim of the new joint venture is to create new facilities in Germany’s major cities focusing solely on locations where purchasing power is very high. Mr. Tavridis will be the CEO of the joint venture. DomusVi, one of Europe’s largest elderly care providers, announced in Q3 2018 three acquisitions in line with its international expansion strategy. Following the add-on acquisition of Sarrikue with three facilities (291 beds) in and around Bilbao (Spain) as well as Bellavida in Portugal (two facilities with 116 beds) DomusVi entered also the Latin American nursing care market by taking a minority stake in Acalis. The strongly growing Acalis Group currently operates 9 facilities in Chile (961 beds), one residence in Uruguay (48 beds) as well as one in pipeline in Columbia. In November the family owned and French nursing home operator Maisons de Famille (MdF) agreed to acquire the German DOREA Group from Quadriga Capital. By this acquisition MdF is the third French operator entering the German nursing care market following Korian and ORPEA. DOREA was established in 2015 by Quadriga as a nucleus and was thereafter successfully expanded by small- & mid-sized acquisitions to 47 facilities in 2018. The Group will perfectly complement the existing MdF network with presence in France, Spain and Italy. Following the acquisition MdF will operate more than 140 facilities with ca. 16,500 beds. The listed French nursing care group Korian has agreed to acquire a portfolio of 1,800 beds in Belgium from Senior Assist Group. Following the transaction Korian will foster its position as market leader in the Belgian stationary nursing care market with more than 12,000 beds. For Senior Assist this transaction is in line with the overall corporate strategy to reduce their exposure in Belgium while focusing on international expansion in Latin America, Turkey and the Middle East. The Schönes Leben Group (formerly compassion) announced in November the acquisition of both Gut Köttenich/Euregio Group (14 facilities) as well as A+R Beteiligungsgesellschaft (3 facilities). Following these acquisitions the specialist provider of services for elderly people over the age of 65 operates 4,000 with the intention to continuously grow by 10 to 20 facilities per year. In July the largest German rehabilitation group Median was put up for sale by shareholder Waterland with a price expectation exceeding EUR 1.0bn. After initially stronger interest the rumored group of potential bidders reduced to some private equity firms such as PAI, I Squared Capital or Brookfield expected to submit bids by end of November. However due to high valuation expectations, exaggerated profitability as well as constraints due to new regulatory approaches by the government a near-term sale is unlikely according to a source involved in this transaction. Since February 2018 several of the key market players in the German ambulatory / intensive care market have changed hands driving the consolidation of the market. Starting in February 2018 Bregal Unternehmerkapital acquired DPG Deutsche Pflegegruppe followed by the acquisition of the German Linde Remeo operations (specialist for outpatient intensive care and mechanical ventilation) in May 2018 by opseo. US private equity investor Advent International entered the ambulatory intensive care market by acquiring Deutsche Fachpflege from Chequers Capital while lately in July 2018 GHO Capital signed a definitive agreement with Vitruvian Partners to acquire the linimed/Fazmed Group. In addition to that, it is rumored that the French shareholder of Bonitas, the largest ambulatory care operator in Germany, is currently evaluating the sale of the group. Boniats is operating in over 80 locations across the country with more than 2,700 intensive ambulant care patients. In October the listed Swedish healthcare services provider ambea has acquired the elderly and social care operations of its competitor Aleris in Swerden, Norway and Denmark creating the largest Nordic elderly care provider. 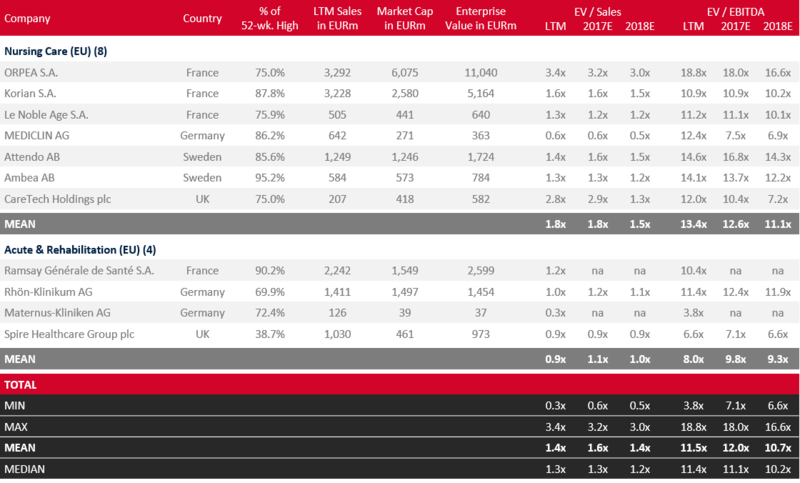 The purchase price totals to EUR 256m representing a multiple of 14.0x EBITDA prior to synergies (or 9.4x adjusted EBITDA). Following the acquisition by Nordic Capital in 2017 the second largest German nursing home operator Alloheim continued its active buy-and-build strategy by acquiring CMS Group. The mid-sized CMS Group operates 23 nursing homes with about 2,000 beds, an outpatient and day-care nursing service as well as about 300 assisted living apartments. The current decline in global equity markets is a good reason to look at allegedly stable industries. The German healthcare market has very favorable characteristics, thereby attracting strategic, financial, local and foreign investors alike in their hunt for safe harbor industries. 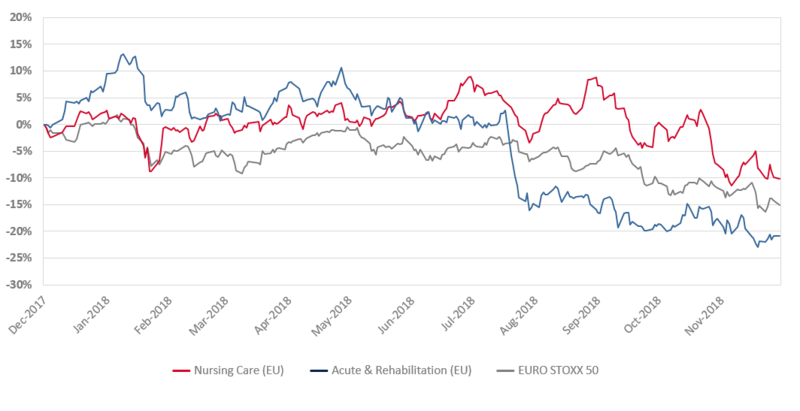 Uncertainties remain how the anticipated regulatory changes in the German acute, nursing and rehabilitation market will impact investments and how much comfort can be taken from recent statements of the ECB as regards the investment environment. Political challenges lie ahead of the German healthcare investors, especially since the governing coalition (in particular their healthcare spokesman Mr. Spahn) is pushing for reforms which either seem to be driven by populist sentiment or a lack of understanding of simple economic principles. The establishment of Medical Service Centers (MVZs) shall not be eligible if the facility focuses on profitability rather than a basic medical care. New hospital-MVZs are assigned to a certain regional district and need be multidisciplinary in order to provide basic medical care. Hospital-MVZs that only cover medical disciplines with high operating margins shall not be allowed in the future unless they are considered indispensable for securing basic medical care in a respective area. Furthermore, the termination of medical disciplines with low margins after an acquisition by an investor shall only be permitted in exceptional cases. Personnel costs in hospitals shall be reimbursed as incurred. Previously, acute clinics with efficient personnel planning were able to realize positive margins as the reimbursement was based on average market levels. Costs related to qualified personnel in hospitals shall be fully financed by the long-term health insurance. 13,000 new jobs shall be created in the nursing sector and be financed via the long-term care insurance and by the patients (out of pocket). Both laws are geared to preserving the weakest stationary health care providers while reducing attractivity for owners, shareholders and investors alike. Both laws limit entrepreneurial freedom and potential return on investments, thus deterring investors. However, without engaging the private sector, necessary structural changes will likely not be initiated, investments in acute clinics will not be financed and the undersupply of stationary care beds will not be resolved. So far the bad news. The good news is that executives of relevant German health care businesses seem to be able to deal with the challenges ahead much better than originally presumed. Recent discussions with leading health care providers indicate that they believe to be prepared for the upcoming changes. Although forecasts have been reduced, this is happening to a much smaller extent than had been anticipated. Additional relief can be found in the low Euro interest environment, which seems to persist for a longer time period. Given the misery of European state budgets (i.e. Italy, Greece, France), it comes as no surprise that the ECB in its latest announcement indicated that no major change in the monetary policy is foreseen in the near term. Explicitly, the ECB confirmed that there will be no spike in interest rates “before Summer 2019”. This is good news for a sector which is highly dependend on real estate and interest cost. Stable interest rates are beneficial for all industries alike. However, the benefits for stationary health care businesses are particularly significant. A low interest rate environment provides the ground for stable real estate costs/rents and continuously high new-build activity. As a conclusion: German politicians seem to do their best to reduce the health care sector’s attractiveness for private investors. However, strong fundamentals and operational excellence still provide the basis for attractive investment cases. Our advisory expertise is founded on an in-depth understanding of the key industries served by the company, covering the industrial and technology sectors as well as the real estate sector. We have successfully advised clients in their key sectors: Internet & Media, Software & IT, Mobility, Mobile & Telecom, Healthcare & Pharma, Retail & Consumer Goods, General Industries and Real Estate. In case you wish to update your profile and/or change your settings click here.